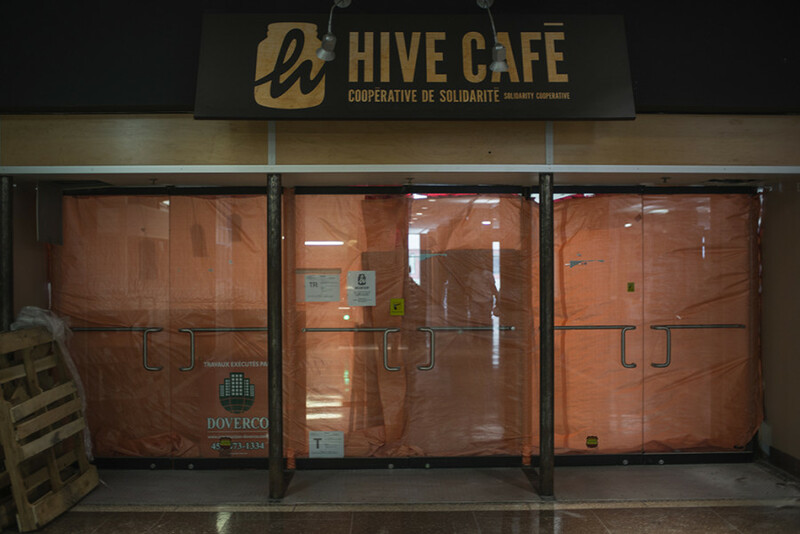 Students looking for a place to study while enjoying a grilled cheese sandwich will have noticed that the Hive Café is still boarded up, with a “Petite Hive” serving adjacent to the café instead. Touted to reopen around school’s start last week, the cooperative’s opening will be postponed at least another week, and could cause its neighbouring space Reggie’s to face delays as well, according to Concordia Student Union VP Clubs and Internal Affairs Lori Dimaria. The Hive Café Solidarity Cooperative team released a statement that “coffee, and basic food and drink items” will be served at the makeshift kiosk on the mezzanine level of the Hall Building, also saying that new workers and a revamped menu were integrated over the summer. It makes no mention of when the space will reopen. With the Hive’s reopening prioritized because it has a governance and operational structure already in place, Reggie’s may not meet its projected late October opening, previously given to The Link by CSU President Terry Wilkings. “If we prioritize the Hive, then some things may not be getting done on [Reggie’s],” Dimaria said. The delay is due to a “couple of hiccups” that occurred during the demolition process. “There are certain things you can’t expect until you’re demolishing,” Dimaria said. According to her, an example of one such complication was the need to tear down a podium, which turned out to be concrete instead of wood. The Hive team also requested modifications to the service counter, and the lighting fixtures had to be changed to comply with new safety standards, the CSU VP added. The CSU council decided last May to hire Doverco at a cost of $1.4 million. They had the lowest bid out of four formal proposals the CSU received.